Saimos no domingo pela manha em direcao a fronteira com o Kentucky, viajando pela I-60 que neste estado vai costeando o Rio Ohio. Passamos pela regiao onde se encontra o Fort Knox e queriamos visitar o Patton Museum, mas ja estava fechado quando chegamos (vai ficar para a proxima viagem...). Na segunda feira chegamos no entroncamento com a US-127 - onde ocorre o "World's longest yard sale" - sao mais de 650 milhas, a maior parte na US-127 Norte-Sul, em que as pessoas colocam a venda "de um tudo", literalmente - tudo o que se possa imaginar - e acontece de quinta a domingo sempre na primeira semana de agosto. Este e o terciro ano que participamos e nos divertimos muito em ver a "tralha" - nem sempre, muitas vezes sao objetos raros e antigos e de muito valor - e sempre achamos alguns itens para comprar - sempre pechinchando pois esta e a regra...kkk...e sempre encontramos pessoas interessantes e esta e a melhor parte. Na primeira noite pernoitamos no Eagle's Nest RV Park, cujo proprietario - Elwood Man - foi extremamente atencioso e ai encontramos varios casais em seus trailers e motorhomes, alguns compradores e muitos vendendo seus produtos diretamente do trailer...bem legal! We left Sunday morning towards the boder with Kentucky driving I-60 which in this state goes bordering the Ohio River. We went through the place where is located Fort Knox and our plan was to visit the "Patton Museum" but it was closed by the time we got there. 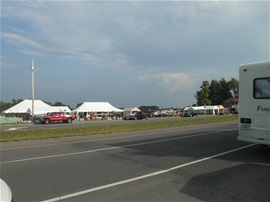 On Monday we arrived at the intersection of 60 and US-127 - where the "World's longest yard sale" takes place. This year it is over 650 miles, most of them on US-127, in which the people set out their tables and tents and sell mostly anything and everything... This is the thied year we participate and we always have a good time watching the kind of things people have to sell. The event happens on the first weekend in August (officially from Thursday to Sunday) but it actually last the whole week. This time we started in the northern part of Kentucky and went all the way down to mid Georgia. We normally buy some items, and have to bargain since this is the "rule", and we also have the opportunity to meet some interesting people here and this is the most interesting part of it. On the first night we stayed at Eagle's Nest RV Park whose owner - Mr.Elwood Man - was very nice and here we met several couples in their trailers and motorhomes, some buying and many selling from their trailers and RVs.